In amoungst a parcel of scrapping goodies I ordered recently was some Tim Holtz/Idea-ology filmstrip ribbon. I thought, as I still had some of my manly themed stash out on my desk that I would make another masculine themed card. The background paper is Kaisercraft from their Timeless Classic pad, inked with Distress of course. The cogs were cut used the Spellbinders Sprightly Sprockets dies. They were just cut from some silver card (I think it might have been from some wedding favours boxes from one of my nephew's recent weddings). The cogs were then inked over with alcohol inks and a bit of black pigment ink, to try to make them look grungy. The balloon and the pocket watch are 7 gypsies stamps just inked with distress (and a bit of crackle accents on the watch). The ute is a Stamp-it stamp coloured with copics. The text is Stamper Anonyomous and Studio G. The filmstrip ribbon was stappled on. Thanks for looking. Wow! This card is fantastic. I love all your details. Very well done! And the cogs do look grungy! Thanks so much for entering ATC's Card with Attitude Challenge. You can enter this card in our Fat Pages challenge also. The link is on our site. We have Top 3 winners now too! Hope to see you next time! WOW!! such a great card with all your elements!! Love the film reel! Thanks for playing along with us this week at Sweet Stamps! Very cool card! 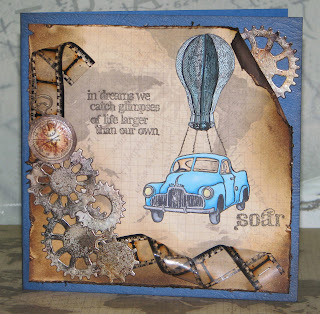 Love the theme and the curled corner and the filmstrip- plus the cogs.... Thanks for joining us at Sweet Stamps! Oh, wow! This is fabulous! I love it! What a great, masculine card. Wonderful! Awesome card , I love the way you used the film strip . Wonderful layout.Thanks for joining the challenge at Card Makin' Mamas. Awesome card!!! Love Thanks for joining us at Love to Create Challenge! Hi Linda thanks for calling by my blog and your lovely comments - see you've just dipped your toes outside of the forums lately - there sure is a lot of challenges out there! Ps we've got a DT call over at Fab'nFunky challenges if you're interested! love what you did with the filmstrip! Hi, Linda! Your card is awesome. So creative! I love that image. Great Father's Day card, thanks for playing along with CMM!